Issued July 1, 2014, to Bandai Namco Entertainment, Inc. The Nintendo DSi was the fourth iteration of the Nintendo DS design. Unlike, previous models, the DSi featured two VGA (0.3-megapixel) digital cameras. One camera pointed toward the user while the second camera pointed away. 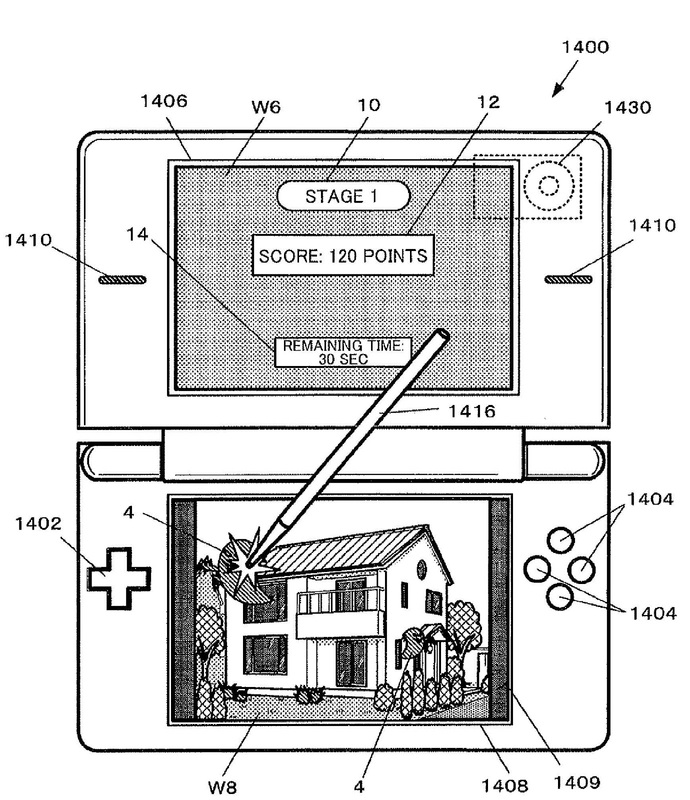 The cameras allowed for augmented reality games to be played on the DSi and U.S. Patent No. 8,764,563 describes one such game. Players use the DSi’s cameras to take photographs of real objects. 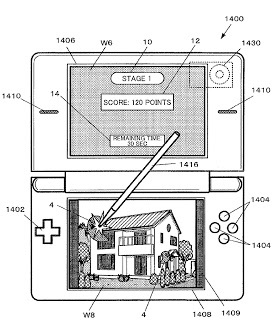 The picture appears on the bottom screen of the DSi while the game analyzes it for recognizable shapes or openings. If the photograph contained a house, the game would look for windows and doors. Based on the analysis, the game will cause characters to appear from those shapes or openings so that a ghost might appear from a window. The player taps on the characters to gain points. A feature image area that has a similar feature (e.g., quadrangular outline) is extracted from an original two-dimensional image photographed by a player. When a game has started, the original two-dimensional image is displayed as the background of a game stage, and a target character 4 is caused to appear or disappear from the extracted feature image area at a random appearance frequency and a random appearance speed. When the player has touched the target character 4, points are added to the score of the player. 1. A method comprising: detecting an image area that satisfies a feature image area condition from a photographed image, the feature image area condition being a condition to detect an image area that has an outline of a given shape and satisfies a proper size condition; displaying the photographed image on a touch panel; selecting character type based on at least one of a color of the image area and a size of the image area; displaying a character of the selected character type on the photographed image in a manner such that the character appears to emerge from the image area; and incrementing a score linked to the character that has appeared from the image area when a user inputs a touch operation on the character, wherein the detecting, the selecting, the displaying the character, and the incrementing are performed by a hardware processor.